The former Alaska governor said in a speech to the National Rifle Association that political backlash is the only thing stopping Obama from gutting the Constitution's right to bear arms. Palin said the public needs to stop Democrats in their tracks, starting with the November elections. 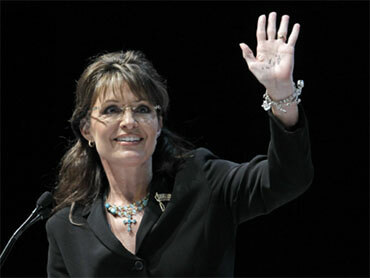 Palin praised the anti-tax tea party movement as a grassroots effort "to get government back on our side." She left the event to travel to South Carolina for a campaign rally with a Republican candidate for governor who is popular with tea party activists. Addressing an anti-abortion group, the potential 2012 presidential candidate said she understood how some women might consider abortion, citing her own experiences as the mother of a child with Down syndrome and the parent of an unwed teen mother. Last year, Palin said that "for a fleeting moment" she considered having an abortion when she learned of her son Trig's prognosis. "It may not be the easiest path, but it's always the right path," she said. Palin used a speech to the Susan B. Anthony List to remind activists why they rallied behind the Republican ticket and why they should work to stop Obama's agenda. She said Obama is "the most pro-abortion president ever to occupy the White House" and asserted that the historic health care reform law would fund abortions. In fact, Obama's health care law would not allow federal dollars to pay for elective abortions. Roman Catholic hospitals and organizations of Catholic nuns backed the measure. U.S. Catholic bishops and major anti-abortion groups opposed it, arguing that federal dollars could end up paying for abortions. Palin challenged Republican women - "mama grizzlies," she called them - to help the Republicans "take this country back" and elect anti-abortion lawmakers. A grizzlie is a bear. She praised female leaders of the tea party movement and invoked her 2008 acceptance speech where she compared herself to a pit bull. "You don't want to mess with moms who are rising up," Palin said. "If you thought pit bulls were tough, you don't want to mess with mama grizzlies." Tea party activists believe that government spending and influence should be limited. The movement's name is taken from the Boston Tea Party, a 1773 protest in which activists in the then-British colonies in America boarded ships and threw their cargo of English tea into Boston Harbor in a symbolic act of protest against taxes.